Should I go back to a snaffle bit? Or stay in the shank? Sunya, Thanks for the question! I like to do both. If someone comes to a clinic I will start teaching them and their horse where they are at. That means in equipment they are familiar with and a speed they are comfortable with. During the course of a clinic, which is either two or four days, we will discuss the benefits of each type of bit. Often I will encourage people to return to the ‘foundation’ work in a snaffle especially if there are some key missing links. For example, if the horse does not know how to spiral out into a counter-bend the I prefer to go back to a snaffle. Also if the horse is tipping their head excessively, for example, if turning to the left the left ear tip is lower than the right ear, then it may help to go back to a snaffle. The reason the snaffle is a great place to return to is because it allows you to ‘shape’ the horse in a different way than you can in a shanked bit. If you are unsure about making the switch I would encourage you to consider the following method. saddle up and ride as normal for 30 minutes in a secure area such as a round pen, arena or pasture. Practice the spiral out exercise. if your horse is doing great, dismount and change to a snaffle bit. Remain in the controlled arena. practice the spiral out exercise again and observe the difference. Using this method should allow you to both stay safe and gain more understanding of the way each bit is influencing the horse. I require my horses to learn the exercises both ways, in a snaffle and in a shanked bit. I always return to the snaffle if there is any confusion. We have just got a pony he is 1 year old and he is still a stud colt we plan on getting him gelded as soon as we can. But I have all but the smart start DVDs of yours but do you have any pointers for me this will be my first time training a pony? I have trained our other riding horses. Do you do anything different when they are smaller? He almost 10 hh and we would like to have him able to ride and to pull a cart. Hes a very friendly little guy. I’m actually working on a write up about this, including video. What specifically bothers you? The more detail you can provide the better so I can capture video of it to help answer your question. Everything about them pawing bothers me, as they dig holes when tied to trailer esp. we have cement in barn aisle, do can’t actually dig there. My two mares have never pawed, and now I have added a gelding (a rescue so don’t know his background) who does show impatience and paws (he’s pawing less I barn when tied, but will do if alone at trailer. He doesn’t like to be left behind). I just brought home a yearling filly, who is very mellow, but will also paw at trailer (I think because she’s alone) but i would like to break this before it’s a habit. Good day Stacy, I need help with my 13 year old Morgan, he refuses to stand still when mounting him . I have been given some advice, to no aval. Do you have any good tried and true tips for me. Thank you and have a wonderful day ! so, why do we use a bit? I am no expert!!! but I wonder if a bit is always necessary to ride/ enjoy a horse-companion. sorry if I sound ignorant…I probably am…thats nothing bad…just IS? My horse has heaves so has trouble breathing. I’m thinking of switching to a bitless bridle, any tips or suggestions for that? Ellen, I’m sorry your horse is struggling with heaves. My pony growing up had heaves and it affected her breathing. For this reason, switching to a bitless bridle won’t help the breathing problem. Our vet was able to give us some meds that helped during the worst seasons. There are also some natural remedies that can help. If we look the other way, when should a shanked bit be introduced to a young horse? I have a three and four year old very comfy in a snaffle, but they obviously need to grow up a bit (no pun intended) at some point. 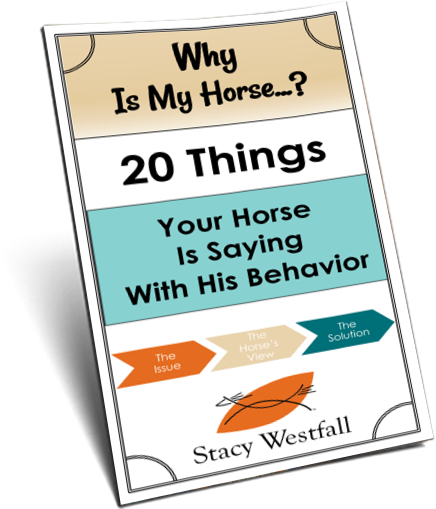 What do you consider a sign that your horse is ready for the change? I own, but I have never used it. I do train my horses to neck rein. I don’t think I know enough to use one. My problem is me, not my horse’s. 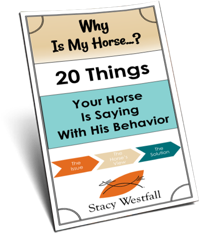 Your talk about ‘motivators’ encourages me to ask you about what I call ‘artificial’ aids…my fairly new horse recently started flipping her head up and acting silly on the trail. My pretty traditional cowboy trainer is suggesting a sort of tie-down thing that goes over her ears, down to a loop over her nose (not below the cartilege) and then has two loops joined by a strap that goes to her girth. She doesn’t seem to mind it, never ‘hits its limit’, and does keep her head down better – this is in the round pen, have not taken her out on the trail again yet. He rode his horse in it for a couple of months and now head carriage is much better and the dangerous head-up thing seems to be over. Your opinion? But I know now how to train the horse without using one and long term the results are more solid when the training is done ‘by hand’ vs by artificial aids. The only way the artificial aid works (if it is a tie down) is that the horse does figure out where the limit is. Some horses do this gently, others may feel more trapped. Many contest horses use them so you can see that horses can learn to understand it. The next question becomes where does it end? Many horses figure out where the rules are, where to put their head and where not to put their head. When the gear is removed some keep the rules and some experiment or accidentally discover there is a rule change when the artificial aid is gone. For me, the reason I stay to ‘handmade’ is that it has longer-term benefits. It takes longer but the training is more solid. If the horse learns the rules change between wearing the tiedown vs not…then you need to go the ‘handmade’ route after that. Why not go that route from the beginning? Odds are that when the issue started to happen there were more symptoms than just the head tossing. Head tossing often comes with some combination of: sensitivity to riders legs, running through riders legs, refusal to go where the rider sends them, anxiety at being separated, wanting to speed up, etc. If those are not addressed then the tie-down could be viewed as putting a cork in a bottle under pressure. Solve the pressure problem (generally an emotion issue or lack of understanding) and the symptom of head tossing goes away. Thanks so much. Yup, just what I thought you’d say. 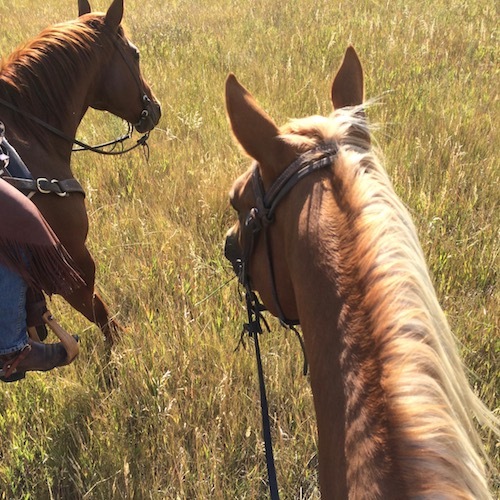 And I agree…but for safety’s sake may pack it along if we go on another trail ride. Have NO idea what this horse has done in her life, and the first two rides were calm, calm calm and then this one was nutty. We are back in the round pen.I would say you hit it with either anxiety (maybe has been an arena horse) and/or refusal to go where I point her – which is anxiety-driven, maybe, in the setting. She definitely wanted to return to the trailer. We will spend some time ‘reviewing’ what I’m pretty sure she knows here at home and make sure it will transfer in less familiar situations. Again, thanks so much, what a gift to hear directly from you! Stacy, I couldn’t agree more about artificial aids. What is also frequently overlooked when a horse cannot or will not carry his/her head in the “proper” position is making sure that the horses dentistry is in great shape, and the rider is more “correct.” So often, we want to blame the horse for things that are not their fault. I believe that horses want to give us their best, and they will try their hearts out every day, as long as we do everything we can to provide them with good health, comfort, and excellence in our hands, legs and seat.